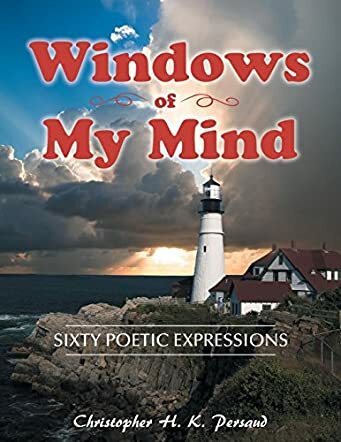 Windows of My Mind: 60 Poetic Expressions is an inspired title for Christopher Persaud's collection of poems; that is exactly what it is, a glimpse of the innermost feelings of one man. Written in freestyle, the majority are longer than average. Each is illustrated appropriately with glorious colour photographs. Subjects range widely from Persaud’s own family, through his Christian faith, his observations of the natural world, to a vivid poetic description of 911, titled simply Nine Eleven, 2001. Windows of My Mind shouldn’t be restricted to poetry lovers or those interested in art; it has so much to offer a broader spectrum of readers. A coffee-table book it is not, unless you wish to keep a guest waiting on purpose; hunger for dinner not ready would be slaked by reading. Christopher Persaud opens with an upbeat, optimistic poem entitled At Dawn’s Early Light, which I read after I tore my eyes away from the photograph that preceded it. Later, I found The Old Man and The Little Boy: they meet on the beach, but he’s meeting his own past! Darkness My Friend is one of the shorter of these poems. It’s the darkness that hides fear, and the illustration is spectacular. What Do You See offers two ways of looking at the same thing, and concludes “What do you see? It tells the difference between you and me!” The Beggar made me cry; we’ve all seen them, and been too busy to care, or perhaps too afraid? There, but for the grace of God, go I? Windows of My Mind entertains and stirs emotions: a must-read.